Pat was born to Lydia and Frank Fisher in Eau Claire, Wisconsin on August 15, 1925. 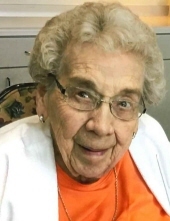 She married Deane Duerkop on June 14, 1947 at St. Patrick’s Church in Eau Claire. Pat grew up in Eau Claire with three brothers and two sisters. She started attending school at the 4th ward and then in second grade transferred to St. Patrick’s, where she graduated from high school. After graduation, she went on to Vocational School in Eau Claire for secretarial work. Pat began working at Uecke Dairy where she met her husband. After all the children were born she went back to work at Peter’s Meat where she stayed for 20 years before she retired in 1974. Pat and Deane enjoyed raising their five children and watching them grow. They also enjoyed golfing, working in the garden, canning vegetables, fishing, attending baseball games, and spending time at their cottage up north. They always looked forward to every Sunday night when they went out to dinner with their friends. Since Deane’s passing in 2006, Pat took up new hobbies such as reading, arts and crafts, knitting, word-find puzzles, games, and crocheting from time to time. Pat is survived by her sons, John (Mary Moore) Duerkop, and Richard (Valerie) Duerkop; daughters Patricia (Charles) Domer, and Janet (Larry) Cornell; sister, Kathleen Fisher; sister-in-law, Bernadette Fisher; 12 grandchildren and 27 great- grandchildren. She is preceded in death by her husband, Deane Duerkop Sr; parents, Frank and Lydia Fisher; son, Deane Duerkop Jr; brothers, Joseph Fisher, Robert Fisher, and Charles Fisher; and sister, Elaine Heffernan. A Memorial Service will be held on Monday April 1st at Cremation Society of Wisconsin which is located at 535 S Hillcrest Parkway in Altoona. The service will begin at 11:00 AM with an hour of visitation beforehand. The service will be officiated by Father Jazdzewski. "Email Address" would like to share the life celebration of Mary Deurkop. Click on the "link" to go to share a favorite memory or leave a condolence message for the family.